A loan is an amount which is borrowed from financial institutions for a certain period of time with a specific rate of interest. A secured loan means when a borrower takes a loan from the lender by pledges some property as a security against a loan. In a secured loan, a borrower just puts property as security it doesn't mean that the lender can possess and use it. If in case the borrower fails to repay the amount of loan in that case a lender has right to assess the secured property can cover the loan amount. In a secured loan, the rate of interest is because a borrower pledges a security. A secured loan is less risky. An unsecured loan is opposite to the secured loan it means in unsecured loan a borrower doesn't need to pledge any property as a security to the lender. An unsecured loan is also known as a signature loan. To repay and the lender's trust to the borrower. An unsecured loan is given to the borrower on the basis of borrowers credit history so there is no guarantee of payment loan amount. In an unsecured loan, there is a risk of repayment of the loan because nothing is put as a security. An unsecured loan is granted on the basis of customer's credit worthiness, financial status and ability to repay. 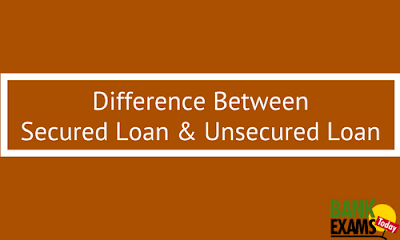 In an unsecured loan, the rate of interest is very because of default. A lender sells an asset put a collateral security. A lender can sue him for the default to pay. A secured loan is at a low interest rate. An unsecured loan is at a higher rate of interest. A secured loan is for a longer time because there is no risk of repayment of a loan and an interest payment. An unsecured loan is for short time because there is a possibility of default. There is a High level of risk in an unsecured loan. In secured loan the amount borrowed is big because of security against loan. An unsecured loan amount is small because there is a high level of risk involved in the repayment of loan amount. Now, more than ever it is very fast and easy to get approved for a home mortgage using the Internet. Know more about quick short term loans and other online loan products from different pages.